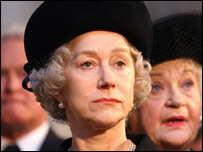 British royal drama The Queen leads the pack at this year's Orange Bafta film awards, after receiving 10 nominations. Dame Helen Mirren is nominated for best actress, and Stephen Frears is named in the best director category. 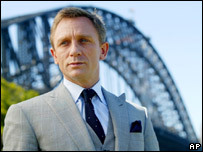 Bond film Casino Royale picked up nine nominations, including best actor for Daniel Craig, while fantasy film Pan's Labyrinth is up for eight awards. The winners will be announced at a ceremony at the Royal Opera House in Covent Garden, London, on 11 February. For the first time in six years, the awards will not be hosted by comedian Stephen Fry, who stepped down last year. His replacement is yet to be announced. While one film often dominates the Baftas, this year sees several movies picking up five or more nominations, including low-budget independent film Little Miss Sunshine and comedy The Devil Wears Prada. "It's very widespread," said BBC film critic Mark Kermode. "Little Miss Sunshine gets more recognition than expected. It's a very open field." However, spoof documentary Borat failed to receive any nominations, despite being widely tipped for Bafta success. The Queen, about the aftermath of Princess Diana's death, is up for best film alongside The Departed, The Last King of Scotland and Little Miss Sunshine and Babel. In the best actress category, Dame Helen, 61, goes up against Dame Judi Dench, who is nominated for the forthcoming drama Notes on a Scandal. Other nominees are Penelope Cruz, Meryl Streep and Kate Winslet. Daniel Craig is one of three British actors named in the best actor nominees, alongside Richard Griffiths and Peter O'Toole. 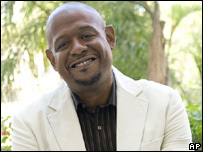 Other nominated actors are Leonardo DiCaprio for the mob drama The Departed and Forest Whitaker for his portrayal of Ugandan dictator Idi Amin in The Last King of Scotland. As well as nine nominations in the main awards, Casino Royale gets an extra nod for Bond girl Eva Green in the rising star category, which was revealed earlier in the week. "It's great it's done as well as it has," said Kermode of the Bond blockbuster. "When Daniel Craig got the role people said he was too short, or too blonde - so good on him." Kermode was also pleased to see Bafta recognise Pan's Labyrinth, which he called his favourite film of last year. "Eight nominations for a foreign language, fantasy film that struggles to find its place in the market - it's fantastic." The British Academy of Film and Television Arts is celebrating its 60th anniversary, after handing out its first prize for achievement in film in 1947. The awards have grown in prominence since 2001, when the ceremony was rescheduled to take place before the Oscars. It is now seen as one of the most important events in the international film calendar and has attracted Hollywood stars like George Clooney, Leonardo DiCaprio and Nicole Kidman in recent years. Last year, Western romance Brokeback Mountain emerged as the big winner, taking home four awards including best film and best director for Ang Lee. What do you think of the shortlist?